For many years, Roger Sutherland was just a voice at the end of the phone for me. He was the man who would ring into my office to tell us exactly how our day was going to go to hell and who we’d need to speak to try and fix it. We met on the odd occasion during after work drinks but it wasn’t until a chance night out in Athens of all places that we became firm friends. Thing I love best about Roger is that he just loves football. While he’s a staunch Hawthorn supporter, he has such a genuine passion for the game and takes unbiased, unadulterated delight in all the good things about it regardless of what club is involved. Not to mention you’ve got to admire someone who can have a dozen beers with you after watching their footy team get beaten on a trip away to Adelaide. So you could say he’s not a bad bloke at all, even though he does barrack for the Hawks. “I barrack for the Hawks because of their success through the mid 70s when I was very influenced by football at that particular time. I started off as an Essendon supporter. We grew up in North Clayton to start off with and my dad used to take me to Windy Hill to the games and I still remember watching Jeff Blethen play, he was the footballer that wore the glasses on the field. It’s a vivid memory that I have of my dad taking me to Windy Hill to go and watch those games. When I was about nine years old we moved down to south Gippsland and not long after that my dad and my mother separated. We were left stranded down in south Gippsland with really no access to football at all because we only had one television channel and football wasn’t shown on the TV then. We used to have to wait for Monday’s papers to find out who’d won games and who’d done what and how. I think through the mid 70s with Hawthorn having their success I thought “this is alright”. My dad had basically abandoned me at that stage so I started barracking for the Hawks because of their success. Of course that rolled on into the 80s when I was a bit older and we used to travel up on the bus every year to the night grand final, which was our big tour. I saw the Hawks have success there and just loved football from then on so they were it for me. 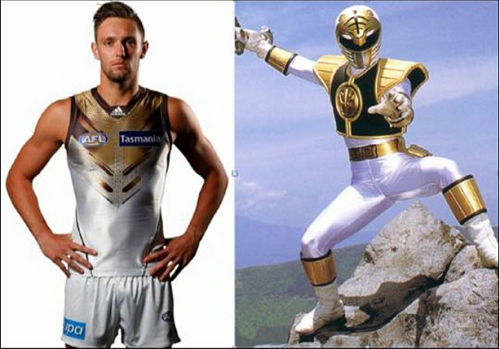 So that’s how I became a Hawthorn supporter. In my history of football with my dad taking me to Windy Hill and being an Essendon supporter at that stage there, I look at it now being a father myself and I look at the influence a father can actually have on his children in relation to football. When my mum and dad separated and my father left, I lost my way and I was isolated down in Gippsland without football. I wanted to follow football and I, as any nine or 10 year old boy wants to do, wanted to follow a successful team. Don’t underestimate the value of a father taking children to the football. Don’t ever underestimate that because it’s a very important thing to do. It’s part of bonding with your family. So what I find is that going to the football with my dad, it consolidated me supporting that team. When he left I felt abandoned by that and I found my own way as far as football went. I then went off and followed Hawthorn and I have followed Hawthorn ever since. I’ve obviously been a member basically since then and I support the club – I went through the early 2000s when we were having no success at all and I’ve been lucky, I’ve been very very fortunate that the club that I’ve picked has been very successful in my lifetime. Unlike some people. I know that when my children were born, I’ve got two children, they were stolen by their mother as Collingwood supporters. I let that happen, as much as I didn’t like it I let that happen because I knew the influences my father had on me with Essendon, I knew that in time I could bring them around. The cunning way that I did that was I would take my kids to games and they would come along to games with me ’cause that’s what I would do on a Saturday while their mother was working. I would take them to the football and they would come and watch the Hawks. I would take them to Box Hill games and they would see their idols from the game the day before, the senior players, just standing around the huddles at quarter and three-quarter time or just standing there watching the game. I can talk about players, like there was Hodge and Mitchell, just players like that standing there and my kids were just gobsmacked that these players were standing there with them – they were superheroes to them at the time. 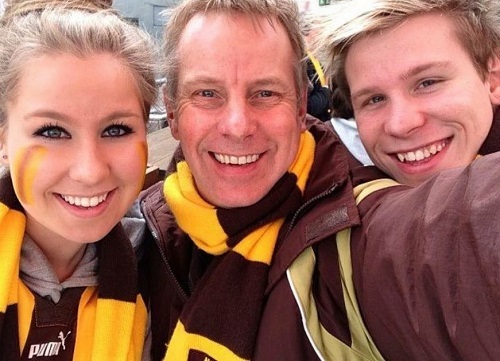 By taking them to Box Hill games and taking them to Hawthorn games, they ended up now both being Hawthorn supporters. Much to their mother’s disgust but they both support the Hawks and they will come to games with me. It was part of my routine with my daughter. One thing I’ve loved with my daughter growing up while my son Kyle was travelling, is that my daughter would always come to the football games – it was our thing, we would go to the football Kelsey and I. We had reserved seats, which I still have anyway, but we had reserved seats and my daughter and I would go. My daughter is a funny football watcher. She’s not a yeller and screamer, she just sits there and watches the game, just observes it, doesn’t miss a thing. She just loves it. And then as she grew up and got to 18 and found her own way, she still follows the Hawks but we rarely get to go to games together these days which sort of leaves a bit of a hole for me there. But I just think football is a really good family thing to go along to and just enjoy. Don’t underestimate the impressions a parent can make on their children by just taking them to games because the kids just love it. They just absolutely love it. Obviously I love Hawthorn’s on field success, but I also just love the culture of the club and the way the club manages their business. I just think they’re the pinnacle of a club to follow because of the identities around that 1980s era: the Dunstalls, the Breretons, the DiPierdomenicos. I see a lot of ex players and people that I followed as icons in the media now, those people who were very successful for Hawthorn. I just really enjoy the culture of the club and how they go about doing their business. It is a real business for them now, that’s how it is, but they’re still the family club. I don’t remember the specific game the first time I went to the footy but I know it was an Essendon v Richmond game and I know it was at Windy Hill. I was one of those kids who used to sit there with the Footy Record and tick off the goals and the points. We used to buy the Record on the way into the game and my dad would have a pen; whoever kicked the goal I’d have to ask him so I would have been the world’s most annoying son to have at the game. “Who kicked that? Who kicked that?” because I wasn’t really paying attention but I had to have the Record filled out with who’d done whatever. One of my biggest ever memories at the game is watching Dunstall kick 17 goals at Waverley Park. That’s one big memory. Sitting there and marking the Footy Record because I had my nephews with me at the time and I remember them marking the Record with Dunstall’s 17 goals. Incredible. I was also part of the crowd on Queen’s Birthday weekend when Hawthorn and Collingwood played when there was 93,000 people at Waverley Park. I vividly remember it because I remember people sitting in the aisles all the way around the ground, all the way down. And it was as a result of that game that they brought in the regulations that you couldn’t have any more there. I remember walking back to Rowville after that game with the biggest swarm of people I’ve ever seen. It was incredible. I’ve seen the Hawks win many premierships and I’ve been lucky in my time. I think it’s been 11 premierships since I’ve been alive. I’ve only missed one, which was the 1961 premiership, because I’ve been alive for the rest. So my best footy memory I think was going to the 2013 premiership and being in the crowd. It was the second grand final I’d been to, I’d seen the Hawks lose against the Swans in 2012, and then seeing them win in 2013 was just the pinnacle for me. One of my greatest memories was last year actually being in Santorini in Greece and getting up at 7am in the morning and turning up at a bar that was owned by an Australian that was showing the premiership and being part of a group of ex-pats that were in Greece and watching the grand final. I ended up falling down, drinking ouzo. We celebrated with beer for breakfast in the morning and finished it off with ouzo and I think we were back in bed by about two o’clock in the afternoon because I was that intoxicated I couldn’t even remember what had happened on the day. I’ll go to the football every time the Hawks are at home but I’ll also go and watch other teams play as well. My partner’s a St Kilda supporter and I’ll just go along and support her and watch the game because I just love watching football and all that it brings. It’s nice to go to a game and be bipartisan. For the Hawks games I’ll go to everything in Melbourne and I’ll structure everything around going there. I’ve only ever travelled interstate once and we know about that, don’t we? It wasn’t successful but it was an awesome weekend and a great experience. 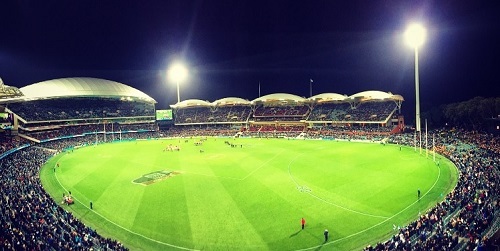 I’d watched the Adelaide Oval since it had been redeveloped and I’d always wanted to go so I ticked that off my bucket list when I went this year and saw the Hawks play Port Adelaide. I’ve never been to Tasmania to see the Hawks play in Tassie so that’s something on my bucket list to do as well. I stand at the football and I’m a quiet observer of the game. I’m not a person that jumps up and down or yells and screams or anything like that. I’ll do the fist pump for the goals and I’ll clap the good things, but I love to just be there and watch it. I stand at the back of M11, that’s my traditional spot if anyone wants to find me at the football then they’ll find me in the standing area of M11. That’s where I stand every week. I love to listen to the boys from M10 there singing their songs and yelling out some of the comedy things they come up with. It cracks me up and I just love it, love listening to them. I don’t have any superstitions but I do have a routine. I live on the fringe of the city, just in the west. I always catch the train or the tram, depending on how I’m feeling, into Flinders Street and I wander over to Transport and I always have a pint at Transport. Then I’ll walk up. I love the walk to the ‘G on game day. I love walking with the crowd, I love listening to the banter in the crowd. I don’t need anybody else to go to the football with, in fact I prefer just to go on my own and do my own thing. But I love the banter of listening to people talk about how the game’s going to unfold when they really have absolutely no idea. I walk around the ground and then I go in, I’ll grab myself a beer and stand in my spot at M11. I’ll never leave a game, I’ve never left a game at all and I’ll stand until the very end regardless of what happens. Then I like to walk out and listen to the crowd again. I like to have a beer a quarter, maybe an extra one at half time and then I’ll wander back with the crowd to Young & Jacksons and if we win, I like to go into Y&Js and have myself a celebratory pint. Then I’ll catch the tram and head home and that’s my day. I have a membership and my number on my scarf is 25, which means I’ve been a member of the Hawthorn Football Club for 25 consecutive years. I believe that everyone who supports a club should take out a membership in some basic form; the clubs make it very very easy for people to be members these days, you can pay the membership off in 10, monthly instalments. You’re not a supporter of the club if you’re not supporting them financially. That’s my belief. I think one of my favourite players of all time that I really enjoy watching is Hodge. Even though he’s a current day player I just love going to the games and watching Hodge play because I love watching him direct – I mean he’s called ‘The General’ – and direct the traffic around the ground. I think when Hodge doesn’t play we lose a little bit of direction out on the ground. I love the identities of the game. I remember watching Brereton play, I remember watching Dunstall play, DiPierdomenico, and a player that I always loved watching too was Gary Ayres. Out of the backline, just tough. Tough. You couldn’t go past Nat Fyfe now could you. I mean, you’d take Fyfe in a heartbeat. For today, you’d take Nat Fyfe if you were grabbing any player from another club. I think as a 6’2″ midfielder with a tank like he’s got… He jumps and he always lands on his feet, he’s like a cat. He soars through the air, lands on the ground like a cat and keeps on going. He’s just an incredible footballer. I’d go to a game just to watch Nat Fyfe play football. The player that I don’t like is Adam Goodes. I’m a Hawthorn supporter and yeah I was part of the Goodes booing, purely because of what he brings. He makes football all about himself. He’s used football as a platform, he’s obviously been a champion of the game – he’s a dual Brownlow Medallist, he’s absolutely a champion of the game no matter which way you cut it. But I think he makes it all about himself and I just think he’s a genuine flog in the way he goes about doing the things he does. I know everyone doesn’t agree with me and I can assure you it’s certainly not a racist thing from me, I just think it’s all about the bloke with the “all about me me me” attitude he has and he even manages to turn the game around that’s someone else’s milestone and make it all about him as well. He’s the player I most like to hate in the game. We have our traditional rivalries. I should have a soft spot for Essendon because that’s where I started. My dad’s gone now, he’s deceased, and I should have a soft spot for them but of course there’s a huge Hawthorn Essendon rivalry. I went through the 80s with the heartbreaks and euphoric feelings of that. I think Essendon is the team I most hate losing to, though I hate losing to Collingwood as well. But there’s no clubs I really overall dislike, I just like going and watching them for who they are and how they’re going about it. I think the inconsistency in the umpiring frustrates me more than anything about football. I struggle with players today struggling with goal kicking routines. I think it’s annoying that professional footballers these days are paid big money to kick goals – I love the goals on the run and the side kicks and the check sides and things like that – but I just see people marking the ball these days with an inside 50, taking two steps back, marking the spot, pacing themselves out, going through their routine of coming in and kicking a goal, and then the ball just spearing off the side of the foot and just not going through. The people that I admire most are the ones that you can count on that just stand there, walk back, walk in and kick the goal. Then back to the centre for the bounce again. I just get annoyed at these routines and the technical side that they’ve brought into the game these days. Just frustrates me. Last Monday I was at work, rolling about slumped over an exercise ball because it was quiet, and waiting for the Melbourne v Collingwood game to come on. I lifted my head and with a glum expression said to my colleagues, “I really miss Carla. If she was here now she’d be talking about the footy with me.” And it’s true – no one I know can talk about every single facet of football like Carla Coslovich can. Want to have a discussion about the best looking players in the league? Carla can. Want to talk about form centre half forwards in the comp? Carla can. Want to debate media coverage of a complex issue or a rule change or how bad Luke Hodge’s parachute tracksuit was when he got drafted? Carla can do all of that. Sadly for me (though not for her) she’s just started a year’s maternity leave so I collared her on her last day and made her have a serious discussion with me about footy. And by serious, I mean I don’t think we looked at that ripped shirt photo of Matt De Boer even once while we were talking. That’s progress. “I go for Hawthorn. Both my mum and my father barrack for Hawthorn and I grew up in a Hawthorn family dating back years and years. We lived in Linda Crescent, Hawthorn, directly opposite the Glenferrie Oval, so I lived and breathed it from day dot. I think I’d be murdered if I stopped going for them but deep down I just love them so much that I couldn’t even begin to think of barracking for another team. I think when Hawthorn nearly merged with Melbourne in ’96 it was one of the darkest days and I never wanted it to happen. It’s always Hawthorn for me. The first time I ever went to the footy it was at Princes Park, the old Princes Park that was Carlton’s home ground so Hawthorn always felt like the red headed step child there, it never felt like home. I used to go with my grandparents and my grandfather would take a medicine bottle and fill it up with a little bit of whiskey. My job at the footy was to make him his coffee with his ‘medicine’ and we sat there. It was always the same group of people that went for Hawthorn. The early 80s were good for us. It was 1986 and a premiership year so I remember that first game and that season for all that it was, cause it was a year we ended up on top. It was good. 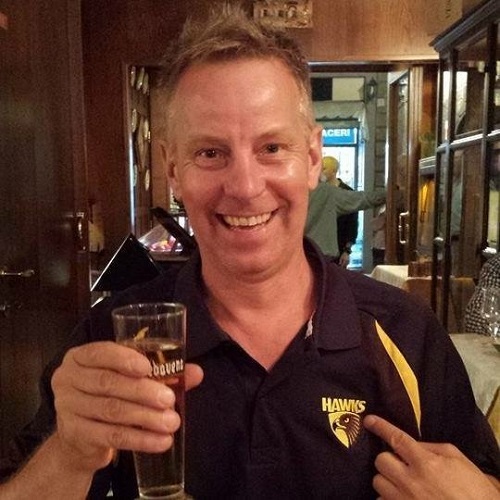 I became a Hawthorn member in 1978, the year of my birth. My grandparents joined me up so that’s 37 years this year. I go to the game every week as long as it’s in Melbourne. I go with my cousin and we have our memberships that we renew every year. We’re two peas in a pod and I wouldn’t have it any other way. What I love most about it now is that I get to take my daughter every week who’s starting to follow in my footsteps, albeit a much subtler version. I’m an annoying supporter and I know that. My mum, my brother, my husband refuse to sit with me because I’m so loud. I’m probably too one-eyed and my voice is just so high pitched and annoying. But I can’t help it and I’m not like that in any other forum. I’m pretty reserved and quiet, I mean I like a bit of a laugh, but at the football I’m almost a different person. It’s almost as though I go back to being very primal. I’m just so nervous that I’m annoying to be with. Oh yeah, I’ve had arguments at the footy. Stand up arguments, pushed each other against the chest, but mainly verbal. These have mostly been on the odd occasion where it hasn’t been Hawthorn’s home game and you’ve got to buy tickets or I use my husband’s MCC to sit there – not often do I have an argument with someone in the MCC though. If I’ve sat in the outer or it hasn’t been our game or it’s an Etihad game then I have quite often had a verbal. If you knew me in my normal environment then you wouldn’t pick it but I’m certainly a different person at the footy. I can’t stand the one eyed supporters or those ones that get on the bandwagon. I hate the people who don’t have that AFL etiquette whereby if your team doesn’t win, you don’t want to be told on the Monday morning when you get to work or teased; you just take it in your stride, understand you’ve had a bad week and move on. So those uneducated people who come out of the woodwork if their team have had a win and you don’t hear from them for the rest of the season, they annoy me. I have lots of superstitions. I find I’m exhausted by October because of all the things that I make myself do throughout the footy season, but if I don’t do them then I kill myself. I have the undies, the good luck undies, although they haven’t helped that much this year! I have to listen to my brother’s All For One Hawks podcast every week prior to the game. I have to say a particular saying and prayer in my shower facing a certain direction, on the day of the game. And every year I have to do something, like a ‘value add’ to the year. So a couple of years ago in 2013 when we went back to back, I got a tattoo that’s got to do with Hawthorn. And so on and so on, there’s always something that I add each year that is different. And I have to watch the same video in my bedroom every night when I go to bed for the entire footy season. So from round one right up until the premiership. It’s Jonathan Creek, a UK TV murder mystery/locked room type mystery show. He’s got about 28 episodes so one of the 28, but I must watch one of his episodes every night for a good six months. In September I don’t eat. If you ask me what month I’m at my thinnest then it’s always September. I live on breathing or smelling food for the month of September, I just get too nervous. So yeah, there’s a couple of superstitions there that leave me exhausted. I have two favourite players. My favourite player in terms of hotness would be Luke Breust – I can’t even deal with his hotness. 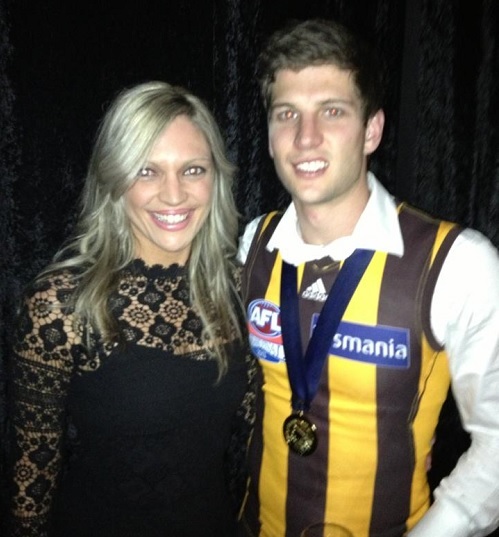 I would say though that my overall favourite player has to be Luke Hodge just because he leads from the front. You can hear him directing the players on the ground from where I sit with my membership. He’s very loud, he’s very directive, he’s purposeful and I just love how hard he is at the game. I’ve also got lots of favourites from when I was growing up, mainly because they fall into the hotness category! Otherwise I really loved the combination of Jason Dunstall and Dermott Brereton. I suppose growing up they were really powerful forwards and a good duo up front. Because we were so successful in the 80s and early 90s they were really prominent, so for me they’re in all my best memories. Looking at our list now in terms of our ballgetters and our clearance players, I would love Joel Selwood. I know he’s sort of coming up to the end as well but just the way he attacks the ball, his tenacity, yeah he might duck a little bit but there’s skill in that as well, and I think he’s a phenomenal leader. So I would love a Joel Selwood at Hawthorn. I don’t like to admit to this out loud but I love watching Buddy Franklin. For all the heartache that I went through when he left Hawthorn, I do love watching him play. I think his natural ability, his height and his size, the way he runs… his engine is just absolutely phenomenal. He’d have to be a stand out player for me. I suppose that for me, the teams that I hate would have to be based on modern rivalries. If you speak to some of the older Hawthorn supporters they go for the Hawthorn-Essendon rivalry, but not so much for me. It would have to be Geelong and Sydney because they’ve been our nemeses for the last eight or nine years. In terms of players, I hate the North Melbourne football side in total. Yeah, there’s a few… Tommy Hawkins. And I can’t even pinpoint why, he’s just a big salami and I can’t stand him. I have no basis for that but I cannot stand him. He really just gets under my skin. I would have to say – and it’s not just because it’s just happened – the 2014 grand final is my best moment because of the year that we had. We lost our coach to a syndrome, we lost about 10 players along the way like Gibson, Mitchell and the like who were out for 9-10 weeks and then you had others who missed significant amounts of time, so in terms of list management it was difficult, we had an interim coach for five weeks who got us through five consecutive wins, no one had us going back to back because of all that we had going on in the year. To get up and to beat Sydney, who we’ve got this rivalry with, it was almost a bit of a grudge match because of the 2012 grand final were we were expected to win. Sydney was on top of the ladder and rightly so because they had a brilliant 2014 season, so to get up and win by that much, everything just fell into place. They ticked every box, they went into it, they were hard, the tackling was hard and it was just tenacious from start to finish. So to win by 63 points in a grand final I actually got to sit there and I enjoyed every moment. The thing for Hawthorn that season, the hashtag in the finals series was #everymoment, and I didn’t realise what that meant until the end of the game. I thought, I did actually enjoy every moment of that. Football is about how it makes me feel. Not just on the day but the lead up to any game, for the whole week it’s the excitement I feel, the nerves, the anxiety. I love the friendships that I’ve formed as the result of footy and the banter in the office and at home. It brings me and my brother and my parents closer than we’ve ever been because of a football team. I also this it makes us absolutely united as Melburnians and I don’t think that any other state can say that they have that love of footy like we do. So it makes me proud to be a Melburnian because of AFL footy. Sometimes the off field stuff tends to get in the way of the on field stuff. Some of the political banter that you hear on talkback radio sometimes overshadows the good stuff that happens. So for the last two years Hawthorn have gone back to back and all you hear about is ASADA and Essendon. I think that really overshadowed two sensational seasons that Hawthorn had. I would change the change. I hate that they change the rules every year just for the sake of change, so that interpretation of the rule really makes things confusing for supporters. One season I know that dropping the ball or incorrect disposal looks like this, the next year I’m looking at it and I don’t get it. I just find that frustrating. 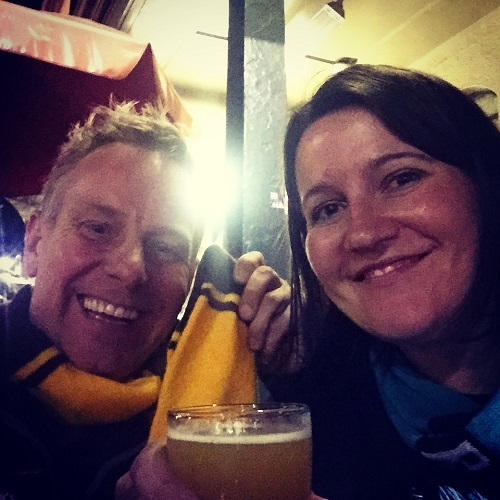 It started last year as a very loose sort of plan; my Hawthorn supporting friend and colleague and I saw the 2015 AFL draw and thought it would be great fun to road trip to Adelaide when our sides played. The atmosphere at Adelaide Oval had been so hyped that we were keen to experience it for ourselves and being two people with a very similar outlook on football, I knew the trip would work because we’d get along win, lose or draw. However something slightly unexpected happened – she fell pregnant. Which meant that our planned night of fun and frivolity in the City of Churches was going to stay just that, a plan. It would have to be next year when we could both enjoy it to the fullest. To be honest I’d all but forgotten about travelling to Adelaide because it seemed so unlikely. A couple of times I reflected on how good it would have been to be there on ANZAC Day playing last year’s premiers but I never took it any further. Then I went on leave for a couple of weeks and a few days before I returned to work I called up to get my shifts. Nothing out of the ordinary until the voice on the other end of the phone said, “Oh and you’ve got a three day weekend over ANZAC Day as requested.” Huh? And then it dawned on me – I’d actually requested the time off months ago because I’d been worried someone else would ask for it off and I’d miss out. Then our trip had been shelved but I’d never bothered to change my request. I think I only took an hour or two of consideration before coming down firmly of the opinion that I should go, solo if needs be. This was too delicious a piece of fate for me to sit at home. I checked the Ticketek website and sadly the membership ticket allocation was exhausted, however I could still get a general admin ticket for around $40. I had a Jetstar voucher from a previously cancelled flight and there were plenty of options still available for under $200 return. Accomodation looked easy and again, under $200 for two nights. Bang, bang, bang, done. Adelaide here I come. I went to the Port Adelaide v North Melbourne game at Etihad in round 3 and after I posted a photo on social media from the game, another Hawks supporting mate left a comment on it saying something along the lines of “See you next week and I’ll be in Adelaide to watch.” Seriously, fate again. This mate and I had a highly memorable night out on the drink in Athens last year while we were travelling so there were definite priors. I let him know I was heading along too and given he was a bit of a fourth wheel with a close-knit trio, he was more than happy to have extra company. We made plans to catch up on Friday night and set about depleting some of the city’s stocks of Coopers. Both of us were incredibly excited to experience Adelaide Oval because it’s been hugely talked up as the venue with the most sensational atmosphere in the AFL over the past few years. Though I’ve been to Adelaide a few times to watch Port play, I hadn’t been for a few years and I’d never been to the ground to watch the cricket. I wanted to hear that roar and sing Never Tear Us Apart with all my people. I wanted to march over the footbridge and be in the majority for once. I just wanted to see what it was like. The fact it was ANZAC Day and that Port were playing the 2014 premiers just added to that sweet sense of expectation and I was beyond excited. As someone who comes from the country I have a real appreciation for our smaller cities. I think often those who are born and bred in Sydney or Melbourne tend to poo poo them as being provincial and dull, often without reason. I’ve had a cracking time every time I’ve visited Adelaide and I think it’s an immensely underrated city. On the Friday night as I walked along Wakefield Street, the remnants of the rain glistening on the streets and the light quickly fading from the sky, all I could think was , “I love this city.” There was such anticipation, both for the night ahead with new friends and old and for everything the weekend was going to bring. It was a beautiful feeling. On game day I woke up early, had a good breakfast to wipe away the memories of the previous night’s drinks and went for a walk through town. I was meeting an old colleague and her husband for lunch (and let’s be honest, more drinks) at a pub in North Adelaide and I had some time to kill. I’m a big believer in signs and as I waited on North Terrace for the tram, the Port Adelaide branded one rolled up. Now there’s a piece of serendipity. I headed down towards Parliament and got off to walk up King William Street watching the majestic Oval rise up out of the damp green lawn on my left. Everyone was in good spirits; young men in suits wearing their grandparents’ war medals, service men and woman fresh from the morning’s march, footy fans getting ready for the game of their lives. The city just felt good. I stopped to snap photos of the Bradman Statue and the Cross of Sacrifice Memorial Garden, then kept walking past St Peter’s Cathedral up to where I was having lunch. My friends walked in and the next few hours were spent in happy reminiscence and discussion of the match ahead. It was a great day already and the game hadn’t even started. We all headed to the ground together early and they gave me the full match day experience and a tour around Adelaide Oval. We watched the supporters stream over the footbridge from the CBD, had our photo taken by the club photographer for their Facebook page, I bought a footy record from their son, then went inside so I could buy one of the special ‘Never Tear Us Apart’ club scarves that are only available here. It was nearly two hours before game time so I thought it would be easy for me to find a good seat and settle in. I was very nearly wrong – almost all the general admin seats had been taken so luckily I was alone and could slip into the solitary seat left high in the rafters of the very last bay in the Eastern Stand. What a view though. Adelaide Oval is just gorgeous, a picture postcard of a ground that has been renovated to perfection. The facilities are incredibly modern and easy to access, yet the exterior retains the charm it’s long been known for. I loved it and I reckon it’s the best ground in Australia to watch AFL at (and I’ve been to them all, bar Darwin and Gold Coast). Watching the defence team take on the emergency services team in the warm up I was struck by just how good a surface it looked to play footy on. I couldn’t wait. Everything about the pre match lived up to my expectations. They had a club great come on to kick a ceremonial first goal and got the crowd going with songs and clips on the big screen. ANZAC Day laid another layer of ceremony on it and it was wonderful to see the teams run through the joint banner together then line up on the field for the Last Post. I was talking through the week to a couple of friends about ANZAC Day and how with five games of football being played on the day this year there had been talk of it becoming commercialised. I don’t necessarily think that’s the case at all and I think both the AFL and NRL have had a big hand in continuing the broader awareness of ANZAC Day, it’s stories and what the sacrifices made 100 years ago mean for us today. That dawn ceremonies and marches continue to be well attended decades on shows the reverence people have for the ANZAC spirit and I don’t think you could understate football’s part in that. During the pre match they showed the names of those who had played for Port Adelaide and Hawthorn as well as serving in our armed forces, while Port’s jumpers had the names of over 100 ex players who served printed on them. I love ANZAC Day, I always feel like it’s the real Australia Day, and to be preparing to watch my football team play in such a huge game was an incredible feeling. I think the best way to describe the first quarter was shocking. 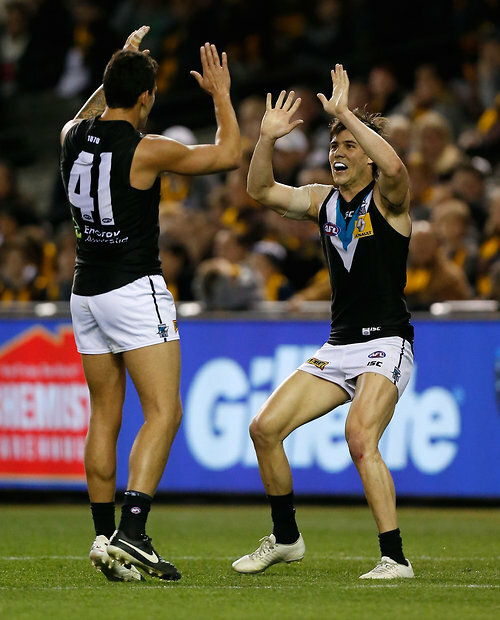 I can’t remember seeing such an amazing quarter of football from Port Adelaide in a long time and to do it against Hawthorn was almost incomprehensible. Goal after goal after goal – we just looked so slick and Hawthorn looked like they’d brought the Box Hill Hawks over. Schultz, Wingard and Monfries couldn’t do a thing wrong and Boak was so tough in the centre clearances. Ryder held his marks and Lobbe’s return lifted the side to new levels. Every repeated mistake we’d made over the past few rounds was wiped away as we continued to kick well and hit targets. Port went into the first quarter break with 50 points already on the board and when I stood to clap the break I was still in shock that this had actually happened. We were down Gray and Wines but somehow we’d manage to lift ourselves, to rise to the enormity of this occasion. This is what we can do. This is how we win. This is the way we play our game. This could win us a premiership. The second quarter brought more of the same and we out-scored Hawthorn yet again. So far there were no marks on my hand of nervousness but I’ve been around long enough to know we hadn’t heard the fat lady sing just yet. My phone was buzzing with messages from mates who couldn’t believe the score and there were posts all over my social media. I mean, Port Adelaide are good – we only the missed the grand final by three points last year – but are we really this good? Are we a 50 point better side than the back to back premiers? Let’s not get ahead of ourselves just yet. The third quarter wasn’t high scoring and Hawthorn started to get the better of us. Then in the fourth quarter all that free running and dominant attacking by the Power was forgotten as we mentally switched to holding the lead rather than winning the game. The Hawks kept fighting back though and added five goals to their tally while we scored only a solitary point. All the Hawthorn fans around me lifted and I sat, quietly rocking in my seat and muttering “Come on boys, kick me a goal” like a prayer to be heard by the football gods. Nothing feels so long as a fourth quarter when you’re trying to hold the win and it was impossible to tell how long there was left at any given time. So I rocked and muttered and prayed and hope and somehow, just somehow, we did it. Few things have ever sounded sweeter than that final siren, eight points up. I stood and punched the air. Boak was awarded the Badcoe Medal for the best on ground and while it was a deserved win, I think the biggest difference to the Port team was Lobbe. His work rate in the ruck and his ability to consistently tap to players is one of the cornerstones of our game. The first three weeks where he’s sat out injured highlighted just how much we need him. It was pleasing to play like we did without the star power of Gray and Wines and I think that will hold us in good stead. But if the win showed Port anything, it was that we can match it with any team on any given day. All we need to do is believe in ourselves and back ourselves in. I stayed for a few rounds of the team song, took a few more photos then filtered out of the Oval with the 50,000 others who’s attended. I’d arranged to meet the Hawks quartet at the Exeter Hotel on Rundle Street and I took my time getting up there, instead soaking up the excitement a home town victory on a day as special as this one brings. These are my people; you just don’t get this feeling in Melbourne. After one beer three of them cried off and it was left to me and my mate to figure out the intricacies of the South Australian glass system (apparently a pint is a schooner and a schooner is a pot/middy) as we ordered “just one more drink”. We talked about footy and work and travel and life. It was 2am before we thought it might be a good idea to head back to our respective hotels and beds and as we parted and I started my walk back through the Rundle Mall I realised what this feeling was: happiness. Here I was in this great city, after watching one of the best home and away wins I’ve ever seen, at the best ground in Australia no less, with friends and many beers drunk. 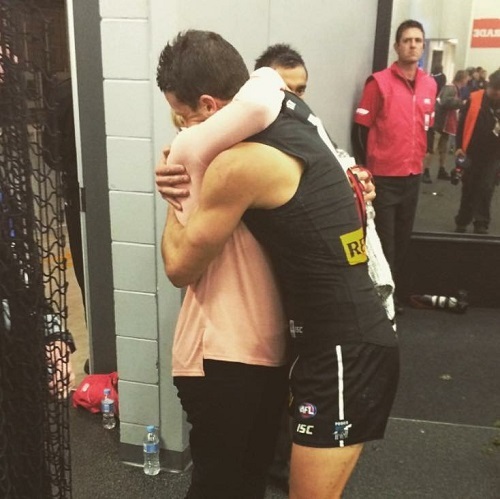 Life, and footy, doesn’t really get any sweeter than that. Two of my Hawthorn supporting friends have run a very funny footy podcast for the past couple of years. While it’s clearly Hawks focused, they tend to get in a ‘not so special’ guest to represent the opposing team each week. I first got a run because I was the only Port Adelaide supporter Rob and Paul knew but now I’d like to think I get asked back because I’m so hilarious and knowledgeable. In any case, it’s worth a listen even if you’re not a Hawthorn fan because they always talk quite broadly about footy and it’s a crack up. This week you get the added bonus of me so there’s never been a better time to join in. 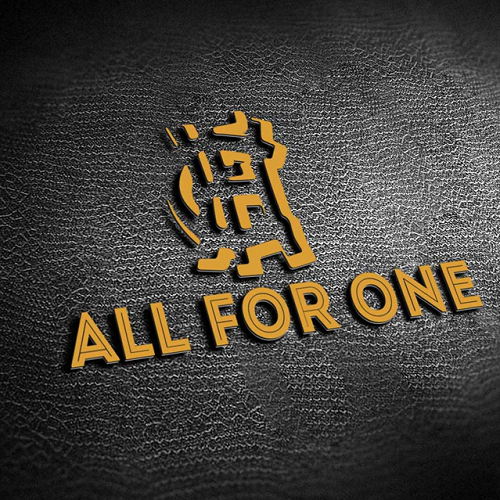 You can download the All For One podcast via iTunes or listen at their website, otherwise they’re worth a follow on Facebook or Twitter.